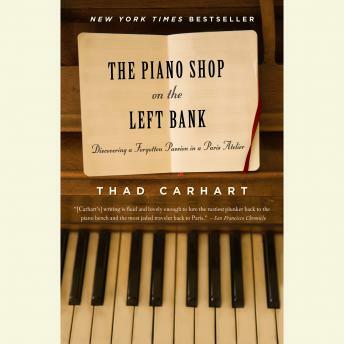 Thad Carhart never realized there was a gap in his life until he happened upon Desforges Pianos, a demure little shopfront in his Pairs neighborhood that seemed to want to hide rather than advertise its wares. Like Alice in Wonderland, he found his attempts to gain entry rebuffed at every turn. An accidental introduction finally opened the door to the quartier’s oddest hangout, where locals — from university professors to pipefitters — gather on Friday evenings to discuss music, love, and life over a glass of wine. Luc, the atelier’s master, proves an excellent guide to the history of this most gloriously impractical of instruments. A bewildering variety passes through his restorer’s hands: delicate ancient pianofortes, one perhaps the onetime possession of Beethoven. Great hulking beasts of thunderous voice. And the modest piano “with the heart of a lion” that was to become Thad’s own. What emerges is a warm and intuitive portrait of the secret Paris — one closed to all but a knowing few. The Piano Shop on the Left Bank is the perfect audiobook for music lovers, or for anyone who longs to recapture a lost passion.